"In this case, our system – this bionic mushroom – produces electricity," said Manu Mannoor, an assistant professor of mechanical engineering at Stevens. "By integrating cyanobacteria that can produce electricity, with nanoscale materials capable of collecting the current, we were able to better access the unique properties of both, augment them, and create an entirely new functional bionic system." Cyanobacteria's ability to produce electricity is well known in bioengineering circles. However, researchers have been limited in using these microbes in bioengineered systems because cyanobacteria do not survive long on artificial bio-compatible surfaces. Mannoor and Sudeep Joshi, a postdoctoral fellow in his lab, wondered if white button mushrooms, which naturally host a rich microbiota but not cyanobacteria specifically, could provide the right environment – nutrients, moisture, pH and temperature — for the cyanobacteria to produce electricity for a longer period. Mannoor and Joshi used a robotic arm-based 3D printer to first print an "electronic ink" containing the graphene nanoribbons. 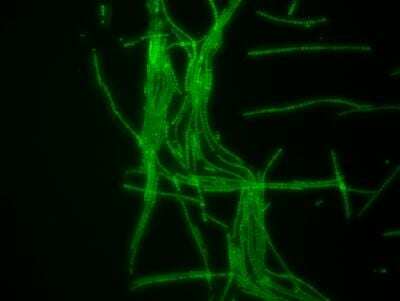 This printed branched network serves as an electricity-collecting network atop the mushroom's cap by acting like a nano-probe – to access bio-electrons generated inside the cyanobacterial cells. Imagine needles sticking into a single cell to access electrical signals inside it, explains Mannoor.